Are there ingredients that always draw you in - to a dish on a menu or to a recipe in a book? I used to know someone who would melt for anything pomegranate. Of course, we all know people who won't order a dessert without chocolate. And then there are the lemon people - some people are just batty over lemon. At one point I baked for a little gourmet take-out place which offered three or fours desserts at a time. The owner asked me to make a lemon cake, and I stared at him. " You mean the lemon cookies and the lemon bars aren't enough? You want three out of four desserts to be lemon?" It hadn't occurred to him, he just knew he loved that cake and those cookies and those bars. Personally, I would say my hopeless sucker foods/ingredients are as follows: duck, scallops, bacon, sausage, blackberries, pecans, oranges, dates, figs, ginger, cornmeal, buttermilk, brussel sprouts, beets, molasses, and cardamom. * When I look back over the recipes I've included on this blog, I can't believe how many of them include one of the those ingredients. Not necessarily in the same way twice, mind you. Figs might show up in a fig and onion spread or a fig cake. But, still: figs. Lots of figs. When you start cooking for someone, the big preferences become clear early on - heavy foods or light, traditional or contemporary, Asian flavors or European, hot or mild. But these small-but-strong preferences take a while to learn. I can only think of a couple people whose palates I know well enough to compile a list for - Mom, for example, loves pecans and walnuts, strawberries, cream, beef and lamb, shrimp, mushrooms. She likes traditional food, not too spicy, lightly salted, a little on the rich side. It can be such a pleasure to know someone's palate and plan a meal accordingly - the favorite food, spiced in just the right way. It doesn't seem like most people get to cook enough today to develop that kind of culinary intimacy. It's too bad. *No wonder I like winter. Oaky, I don't have pictures, because I'm lame. But I did my best to conquer the monster zucchini. 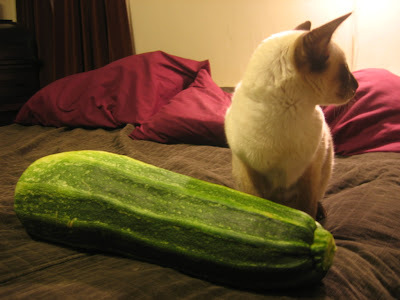 I fear that ultimately the marrow won. After three batches of zuchinni bread (five loaves and a dozen muffins), half the squash still sits in my fridge, mocking me. But I'll have the last laugh. It's gonna sit there until it shrivels or rots. So, zuchinni bread. A use-it-up staple. A stalwart of the church bake sale. A less-guilt-provoking form of cake. Always pretty good. Always a little boring. I did not want five loaves of boring in my freezer. So this is what I did. I pulled out the Silver Palate Cookbook for my baseline recipe (Silver Palate being the best go-to cookbook for 1980s favorites). I laid out three bowls and started measuring the dry ingredients into each one, replacing 1/2 cup of the flour with whole wheat pastry flour and adding 1/4 cup of toasted wheat germ into each one. Bowl one then got 2 teaspoons of cinnamon, 1 teaspoon (heaping) of cloves, and a teaspoon of ginger. Bowl two got a teaspoon of fresh lemon zest. Bowl three got 1/2 teaspoon of dried orange peel and 1/2 cup of cornmeal. Now for the wet mix. I reduced the sugar by 1/4 cup for all three versions. Otherwise stayed pretty much with the original. Beat the heck out of each of these, then blended in the zucchini. The recipe called for two cups - I increased that to three for batches one and two, and kept it at two, but added an additional cup of shredded carrots, to batch three. Now, the zucchini part turned out to be a bit tricky. I usually shred by hand, because I have a tiny, irritating food processor with no shredder attachment. Or at least, no shredder attachment I can find any more. Maybe it came with one. I don't know. But I wasn't going to shred all that squash by hand. So I used the blade, and it kind of hacked the zuchinni into little bits. Which was fine for Batch One, because I started on the stem end and it was kind of narrow, so there was less moisture and the bits stayed relatively dry. But by Batch Two, the bits had turned into soup. I sort of strained them, but I pretty much ruined (in an aesthetic way, though thankfully not a can't-eat-it way) Batch Two. Those loaves came out really spongy, the result of WAY too much water. Having been observant enough to notice that the batter for Batch Two was as thin as my G&T, I squeezed the excess moisture from the zucchini for Batch Three. This batch was the winner, so I'm doing that from now on. Okay, at the end, you get to fold in the fun stuff. Batch One (spices, dark brown sugar) got dates and toasted walnuts. Batch Two (lemon zest, light brown sugar) got dried cranberries and candied lemon peel (which fell to the bottom because the batter was wet, wet, wet and thin, thin, thin). Batch Three (cornmeal, orange peel, carrot) got candied ginger. Batch one made a spicy, dark, good but relatively traditional zucchini bread. Batch Two suffered from issues unrelated to its flavors, which were fine. But Batch Three was a major winner. That 1/2 cup of cornmeal, which I feared would disappear, proclaimed itself, and played well off the classic carrot-orange-ginger combination. The color was lovely (sorry again for the lack of pics). And the whole thing was so unexpectedly non-zucchini-bread-ish. I will definitely make this again. And, as far as cake goes (because who are we kidding here, this stuff is cake), this version has at least some nutritional virtues - some zucchini, some carrot, a bit of whole grain, omega-three eggs. I could almost convince myself that it's good for me. It's good for my soul, at any rate, to have a freezer full of zucchini bread. Made stock this weekend, too, so my freezer at the moment, full as it is of baked good, stock, homemade pesto cubes and local pork and beef, has some serious happy energy. Good thing, too, because I'm going to have no time to cook for the next month. An enterprising New Yorker tells the hilarious, fascinating story of creating a tiny farm in his 800-square-foot Brooklyn back yard. To put to the test the arguments of the "locavore" movement—that people should eat only what's grown within a few miles of their home—he planned to live exclusively off the farm for one month. Okay, I'm going to make this really simple so that everyone can understand: Locavores don't think people should eat only what's grown within a few miles of their home. Rather, locavores think that people should try, whenever possible, to choose food grown closer to home rather than food grown further away. That might mean making a number of adjustments to the usual American way of eating, such as 1) growing your own, 2) buying directly from local farmers rather than from supermarkets, 3) choosing local ingredients like honey or mussels instead of exotics like sugar or Chilean sea bass. What it doesn't mean is never eating a chocolate bar again, or drawing a five-mile-wide circle around your house and trying to live on what's produced within. Sure, people have done that sort of thing (although "a few miles" is usually 100 or 200 or 500), but as an exercise, a test, an exploration. That's why they call it the Eat Local Challenge. I fear that the Challenge has suffered from its own success and come to represent the locavore movement overall to a degree that is inappropraite. To say the locavore movement is about the Eat Local Challenge is like saying that being healthy is about running marathons. Not even marathoners think everyone should run a marathon. Most people who do the Eat Local Challenge don't really think other people should necessarily do the same. But marathoners probably do think people should get some exercise, and locavores do think that there are some pretty big advantages to eating food with a local flavor. Let's go through them again, just for the heck of it: transparency of agricultural practices for the consumer, connectedness to the farm community and resulting increased awareness of farm-related issues, decreased fuel dependency, the increased national food security that comes with having many farms over a wide geographical area, rather than just a few concentrated in a couple small areas, cultural preservation of both rural communities around the country and local traditional foods, preservation of at-risk open farmland and vital wildlife corridors, and, of course, really good, really fresh produce. a blog out of Rhode Island focused on local food. Just a tip.